As promised, today begins a short series which also serves as our summary of the year’s sports science news. I’ll be looking at the Top 8 stories of 2008, with a sports science spin (in case you were wondering, eight is the lucky number of the year – just ask the Chinese who started the Games on 8/8/08, and Michael Phelps, who bagged 8 golds! That, plus the fact that I couldn’t think of 10!). At a later stage, I’ll look back at my own personal highs and lows of the year in sport, the more news-oriented post, but for now, it’s the stories with the sports science angle that take the limelight. And we begin with NUMBER 8. One year to the day before the Games would begin, back on the 8th of August, 2007, the Beijing pollution problem hit the news for the first time, when the IOC President Jacques Rogge cautioned that some events may need to be rescheduled because of Beijing’s notorious pollution problem. The events in ‘danger’ were the endurance events, like the road cycling and marathon events. In anticipation of this problem, Beijing’s organizing committee initiated all kinds of strategies to reduce the problem – a timetable that would allow only odd-numbered licence plates on the road on certain days, even-numbered plates on other days was one example. Factories were relocated, though this would later cause controversy when it emerged that initial promises to do this were not kept. As potentially damaging as this situation could be, it didn’t capture the public’s attention too much, until about March this year. That’s when the new world record holder in the marathon event, Haile Gebrselassie, announced that he was considering WITHDRAWING from the Olympic marathon because of this pollution issue. Other athletes had weighed in on this debate (Meseret Defar apparently called the conditions “disgusting”), but it was the sports science reaction that was most interesting. Back in 1968, the Olympic Games were headed to Mexico City, at an altitude of 2,240m (7,349 ft). There was much debate about the effect of the altitude on the elite athletes, and because of physiologist’s experience (and the obvious experience of athletes) with exercise at altitude, it was known that performances would be affected. Few knew, however, just how large the impact would be, because the level of athlete in question had never been observed in laboratory studies. Some were suggesting that the altitude would be dangerous to athletes’ health, others suggested that elite athletes would be better able to handle the change, and the effects would be minimal. 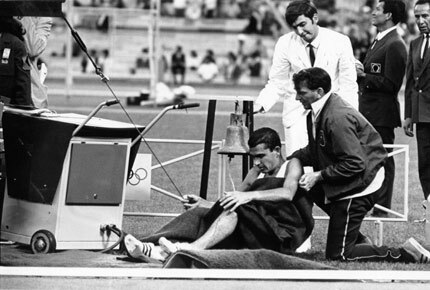 As it transpired, perhaps the biggest effect was on the sprinters and speed athletes. Bob Beamon just about jumped right over the sand pit to set one of the most amazing world records in history in the long jump (8.90m). All the sprint records fell at the meeting. It was a sprinter’s paradise. So Mexico City answered the question. Beijing didn’t. The big nations certainly took every precaution to avoid the potential effects of the Beijing haze and smog. The Australians announced an asthma-specialist in their 50-man medical team. The Great Britain team, along with the USA, Japan and Germany, developed much spoken about “gas masks” that athletes should wear when warming up and around the village. The USA had a head start, because they adapted masks that had been developed by the CIA in response to terrorism threats for the Athens Games four years earlier. 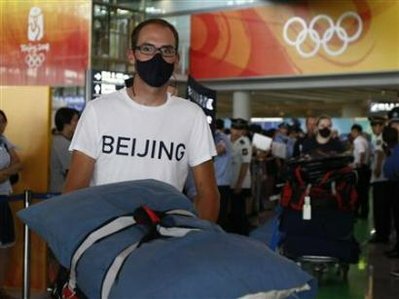 It was one of these masks that caused some of the early controversy in Beijing, when one of the USA’s track cyclists arrived in the Beijing airport wearing the mask (see picture on the left). The minor diplomatic crisis was averted by a heartfelt letter of apology from the athlete and the US Olympic Committee! And then, just as suddenly as the smog had started dominating the headlines, the controversy disappeared (unlike the smog cloud over Beijing typically does). August 2008 was, however different. In the end, the pollution may have played a very tiny role in performances, and no doubt some athletes were affected. But once the action began, the pollution issue was (perhaps rightly) relegated to an afterthought, replaced by on-field action. To this day, I’ve not yet seen a research paper on the effects of the pollution (though I’m sure someone was monitoring the levels and athlete’s symptoms – if you did, and you’re reading this, we’d love to hear from you!). The women’s marathon, meanwhile, was run in cool conditions, with light rain, meaning that the pollution levels were unlikely to be especially high, and so the slowish time was a function of tactics, not the limiting air quality. So on a pure-performance basis, Beijing will be recorded in history as “ideal” for long-distance running! That of course does not tell us whether or not the pollution made a difference. Perhaps nothing will, and we’ll be left to guess forever? We did receive some emails from within the village, from scientists who were working with some of the teams (the teams who actually bother to send this kind of expertise – you can be sure it was not South Africa). Their reports suggested that some of the athletes were having some problems, with sinusitis, breathing difficulties, headaches, burning eyes etc. Quite how this translated into on-field/track performance is impossible to know. If there is a study out there, please let me know, I’ll gladly report on it! But until then, the Number 8 Sports Science story of 2008 was the lack of any noticeable impact of pollution on performance, probably because the experiment never happened! I would guess that the measures taken by Beijing’s organizing commitee, combined with the frequent rainfall during August, meant that Beijing’s pollution levels were probably pretty close to “normal” for the Games. And that, in turn, meant that the theoretical problems, were never encountered. Much hyped, much spoken about, blamed for Gebrselassie’s absence from the Marathon, the controversy disappeared as suddenly as the Games began. So, we were denied our “experiment”, but we got some fantastic performances instead. A fair swap, and our Number 8 story. Join us tomorrow for Number 7! This post is part of the following threads: News/Controversies, Olympics Games, Beijing 2008, Year-in-Reviews, 2008 – ongoing stories on this site. View the thread timelines for more context on this post.